Tag Archive | "Samurai Gourami"
The Samurai Gourami (Sphaerichthys vaillanti) is a semi-rare species that is found in the Kalimantan River in Borneo; more specifically, in the area of the village of Nangah Sebroeang, which is south of the Danau Sentarum National Park in the upper Kapuas river basin, West Kalimantan province (the Indonesian part of Borneo). 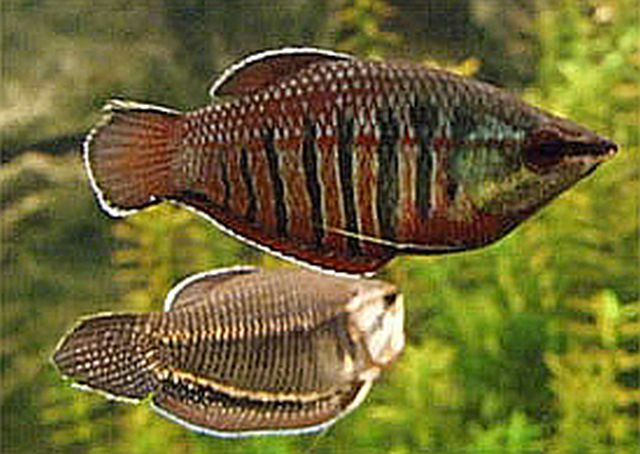 Samurai Gourami appear to be endemic to the Kapuas drainage where it has also been recorded from the Danau Sentarum lake system, to downstream near the city of Sintang. Samurai Gourami are categorized under Anabantidae and like other gourami have a labyrinth organ that allows them to survive oxygen depleted environments and deteriorating water conditions that would kill other species. 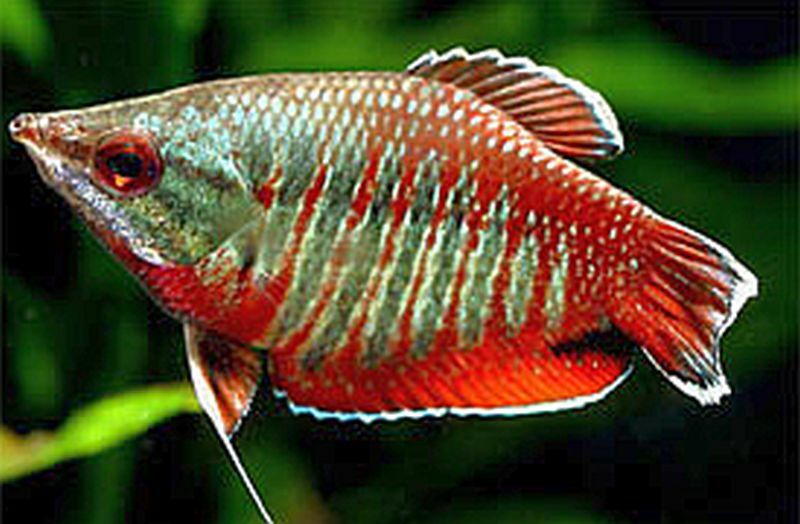 Although sexing is difficult, the females have vertical red and green bars and possess a uniformly straight lower jaw profile and more acuminate head shape than the males. The males are more plain and usually a pale gray or have a brownish tint. Due to the presence of distensible skin that expands during mouthbrooding, their lower jaw is always slightly rounded. During spawning their colors become more intense, but females are always more colorful than the males. Sphaerichthys vaillanti live in the very soft, acidic, tannin stained peat swamps, brick water streams, and slow moving river systems with negligible amounts of dissolved mineral content where the pH can be as low as 3.0 or 4.0. They normally inhabit areas where the dense rain forest canopy leaves very little light penetrating the surface of the water and the substrate is usually littered with rotting leaves and fallen tree branches. The aquatic plant species that may grow in these conditions include genera such as Cryptocoryne, Blyxa, Barclaya, Eleocharis, Utricularia, and Lymnophila. Samurai Gourami are not common even in the Danau Sentarum system where they are normally collected in small creeks among the debris and leaf litter. Their color pattern and lethargic swimming behavior enable them to mimic the dead leaves where they are collected, making them very hard to detect. Although Sphaerichthys vaillanti is not as sensitive to keep as the Chocolate Gourami (Sphaerichthys osphromenoides osphromenoides), it is not considered a “hardy” species and does require specialized care. Samurai Gourami are a bit larger than other gourami and are best kept in smaller groups instead of pairs. A 20 or 30 gallon tank is a good size for a group of 6 to 8 fish. In an aquarium environment, Samurai Gourami require very soft, acidic water with a pH of 4.0 to 5.0. Their water should be filtered through aquarium grade peat to maintain the acidic conditions they need and substantial amounts of driftwood or bogwood should be added to the tank for hiding places. Beech, Ketapang Almond Leaves , or Oak leaves should also be added to the tank to provide beneficial microbes that occurs with their decomposition. Indian Almond Leaves release tannins and other chemicals into the water that create a blackwater environment that the fish need. They also provide a food source for the fry as they decompose. You can remove the leaves and replace them every few weeks or so, or you can allow them to fully break down in the tank. Because they live in still water environments, there should be very little water flow in the aquarium. Avoid large water changes that can change the chemistry of the system. A 10 to 15% water change every week is more than adequate. Because Samurai Gourami is a shy, extremely timid species, they do best under dim lighting. Their tank should have plenty of floating plants and be densely planted with low light loving aquatic vegetation to help them feel more secure. Plants from genera such as Microsorum, Taxiphyllum, Cryptocoryne, and Anubias are recommended for the tank. When imported, Samurai Gourami are often acclimated in water with a higher pH. Because they are extremely susceptible to fungal infections when kept in water at a higher pH, they should always be returned to the blackwater conditions that mimic their native at a pH of 4.0 to 5.0. Unlike most species of gourami, Samurai Gourami are mouth brooders. Females usually defend their territory while the males brood the eggs. During the two weeks it takes for the eggs to hatch, the male will keep them in his mouth and not eat until hatching takes place. Unlike most other gourami species, courtship is initiated by the female and the pair remain upright during spawning. The spawning process usually takes several hours. It is important for the rearing tank to have a tight fitting cover to keep the air inside warm and humid for the proper development of the labyrinth organ in the fry. , and bloodworms. They may accept freeze dried bloodworms and if you’re lucky, some may even eat a quality carnivore flake food; but be prepared to stock up on live and frozen foods if you plan to keep these fish. 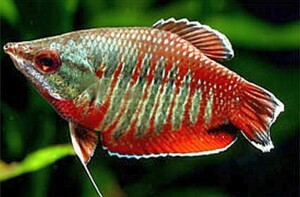 Samurai Gourami are almost never available to tropical fish keeping enthusiasts. From time to time, they have occasionally been offered for sale by reputable global dealers online, but always at a high cost.